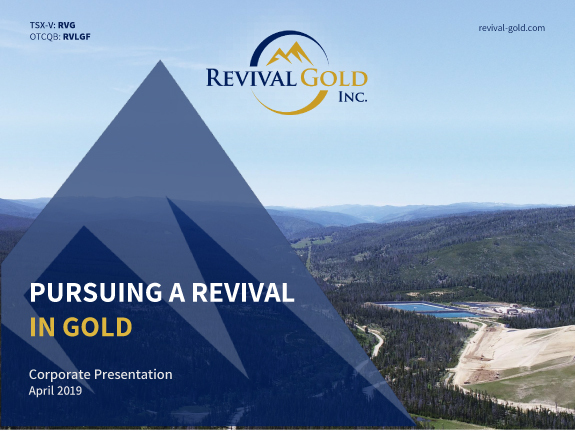 Revival Gold Announces Additional Drill Results at Beartrack; Receives Permits to Commence Drilling at Arnett - Revival Gold Inc.
Toronto, ON – September 19th, 2018 – Revival Gold Inc. (TSXV: RVG, OTCQB: RVLGF) (“Revival Gold” or the “Company”), a growth-focused gold exploration and development company, announces results from four additional holes from its 8,000-meter core drilling program at the former producing Beartrack Gold Project (“Beartrack”) located in Lemhi County, Idaho. 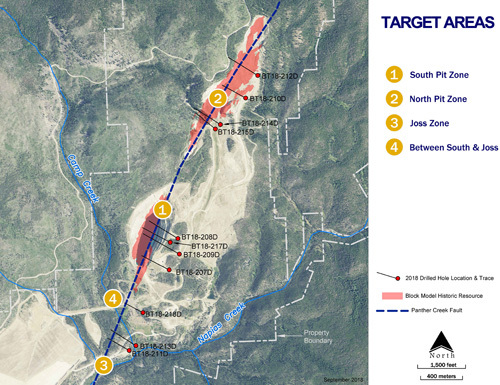 In addition, Revival Gold has received permits to commence drilling at the neighbouring Arnett Gold Project (“Arnett”). Permits received to allow an initial seven-hole 1,000-meter core drilling program at Arnett. Drilling is expected to commence with a third rig on the Beartrack-Arnett project area in early October.1 Drilled width; true width estimates are presented in the table below. 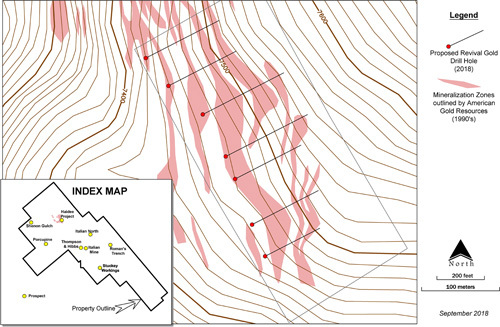 True width estimates in the North Pit and Ward’s Gulch areas are based on a vertically dipping mineral zone. True widths in the Joss area is unknown (n/a) at this time. 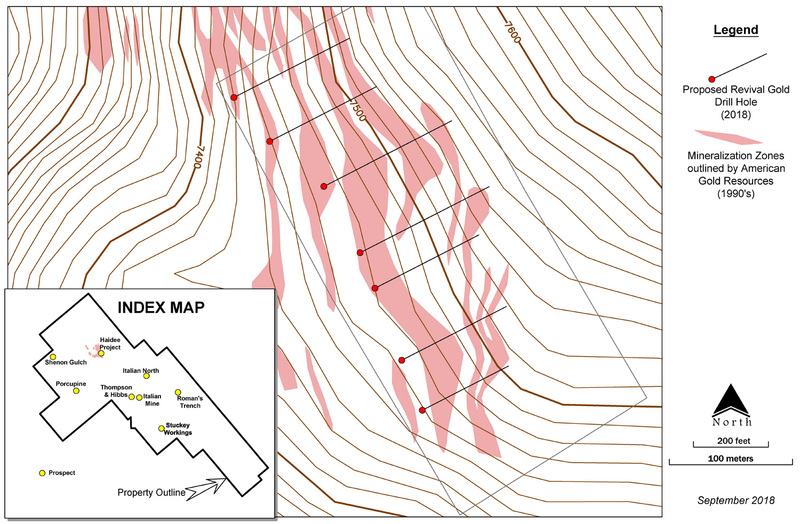 Drill holes typically steepen during drilling so the inclination of the drill hole at depth may not be the same as the inclination in the mineralized zone. Recoveries for the intervals 111.1 meters to 112.6 meters and 120.4 meters to 121.9 meters were 50%, 44% and 40% respectively. Recovery for the interval 316.8 meters to 317.3 was 47%. Recoveries for the intervals 227.7 meters to 228.4 meters and 228.4 meters to 230.7 meters were 48% and 0% respectively. The interval 0% recovery was included at zero grade. 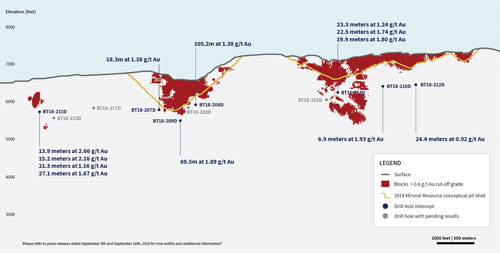 Steven T. Priesmeyer, C.P.G., Vice-President Exploration, Revival Gold Inc., is the Company’s designated Qualified Person for this news release within the meaning of National Instrument 43-101 Standards of Disclosure for Mineral Projects and has reviewed and approved its scientific and technical content.